How SEO Can Increase Sales of Your Brand? SEO also known as Search engine optimization is a very good digital marketing technique for driving organic visitors or web traffic to your website by ranking on good position on search engines like Google, Bing and others. High traffic = Leads = more Sales = good Business. SEO is more practical and continuous thing in digital marketing field, but ROI rate is very good than PPC or other services in Digital Marketing. In SEO, digital marketing experts optimizes your website to be more accessible to search engines like google, bing etc. and if that is achieved successfully, you get ranking in the top positions of the search results on Google or Bing. It leads to the better discovery of your products and services with high visibility of your business on the web. Hence, SEO service is essential for any brand or business because here you don’t need to spend large money like in other digital services like Advertising or Social Media Management. This doesn’t means that these services are not important, everything in Digital Marketing plays an important role in building business. PPC also known as Pay Per Click is expensive sometimes specially for new comers. The main difference between SEO and PPC is that traffic coming from SEO (organic) is free (basically one time long investment, if you hire someone) while traffic generated from PPC is not free (as the name implies you have to pay a cost per click). Do you know that Ranking your website in the top three of SERP (Search Engine Rank Page) will massively increase your organic traffic. This is because out of 100 about 70-80% of people clicks on websites showing in top 3 rankings of Google. With increase in visibility and visitors, it helps your business grow with high sales without spending any money. Isn’t it good? Your brand will enjoy a high ROI (Return on investment), and you know more than that which you get after spending on PPC or Display Ads. If you can invest your time, Invest that time on right strategies of SEO because i think Your Website Content + Right Strategies = High Traffic & Increase in Sales. Now if you can’t invest proper time, then i will suggest to hire an SEO services agency and let them do that work and you can focus on your brand or product. Using right and latest strategies are very important in SEO. To maintain quality Search Engines like Google regularly make some changes in their algorithms. This helps Search engines to show best possible results in their SERP’s. Consistency in SEO is very important. SEO increase ranking of your business website on Search Engines on certain keywords. (the keywords on which you want to rank). Gain high reputation and identity. Reduce the bounce rate from your website. Increase authority in your niche industry. Promote your brand or business. With proper SEO you can promote your brand anywhere in the world which means boost in sales of your Business. Now Big Companies are taking these SEO services which shows how much is this important. I highly recommend SEO for small and Medium businesses who want to increase their sales. Suppose you deal in Aluminium doors and glasses and you have many competitors in your city. 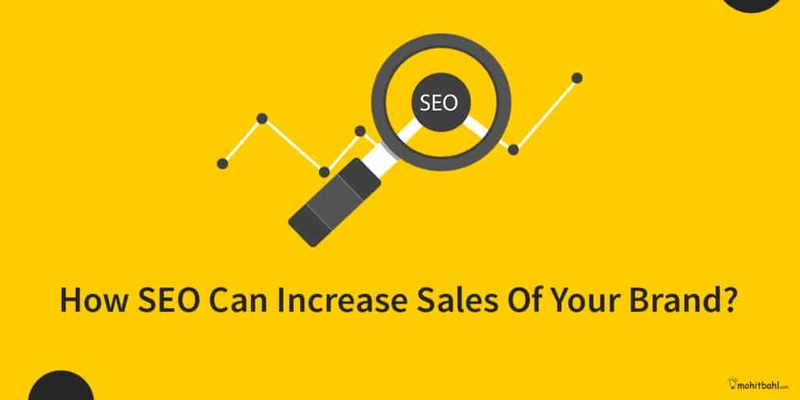 How SEO will help you get Sales ? After doing SEO for your business, your website is on top on Search Engines now.. Now Suppose someone searches Aluminium doors near me, this is a keyword on which your sites is ranking. That Person will see your website and contact your directly.. This is how SEO helps any business getting more and more business. Further, it lets you grab attention and increase the sale of your brand or business immediately. I also want to add one more thing here, that SEO is a long time process. It’s not as instant as PPC or display ads. But, Its very cost efficient than of others. It requires less investment to be done but it takes some time for your website to get ranked and you have to wait for that time. This time can range from 1 month upto 1 year. Time depends on the type of Keywords, you choose to get ranking on Search Engines. Highest Competitive Keywords take more time to get good ranking. That’s why, we all marketers invest our time in low competitive keywords as it takes less time. Other factors like Backlinks, high quality contant also matters alot. So facus on everything. SEO is more practical and proven method in every industry operating online. It is one of the best mehtod to promote and increase ROI of your business. But What if i want Instant Results ! If you want instant web traffic or visitors to your website. You can use the PPC or Pay Per Click Services from an expert to get qualified leads and sales. I highly recommend to hire the best PPC Agency who can help you do the proper management of your ads which can help you get more qualified leads, sales and build brand identity. But make sure, you have some funds for this as PPC by name makes it clear Pay Per Click, means whenever someone clicks on your website, they will charge something..
SEO can increase sales of your brand, specially if you’ve shortage of funds. if you want best SEO results, you have to use the latest strategies of SEO. I had many startups as my clients and almost 80% of them doesn’t prefer PPC in the staring.. As it requires a lot of funds here and its difficult for a startup to have funds.. So they prefer SEO in the starting… But Medium Size Business prefer PPC advertising along with SEO, as it provides instant results and PPC is cheaper than other offline advertising mediums. If you cant invest your time on SEO or you just want to focus on your product or services, you can hire my own Complete Digital Services agency which is awarded as the best Digital Marketing Agency, I had 30+ in house experts, along with me, who will help you get best possible results in short time.